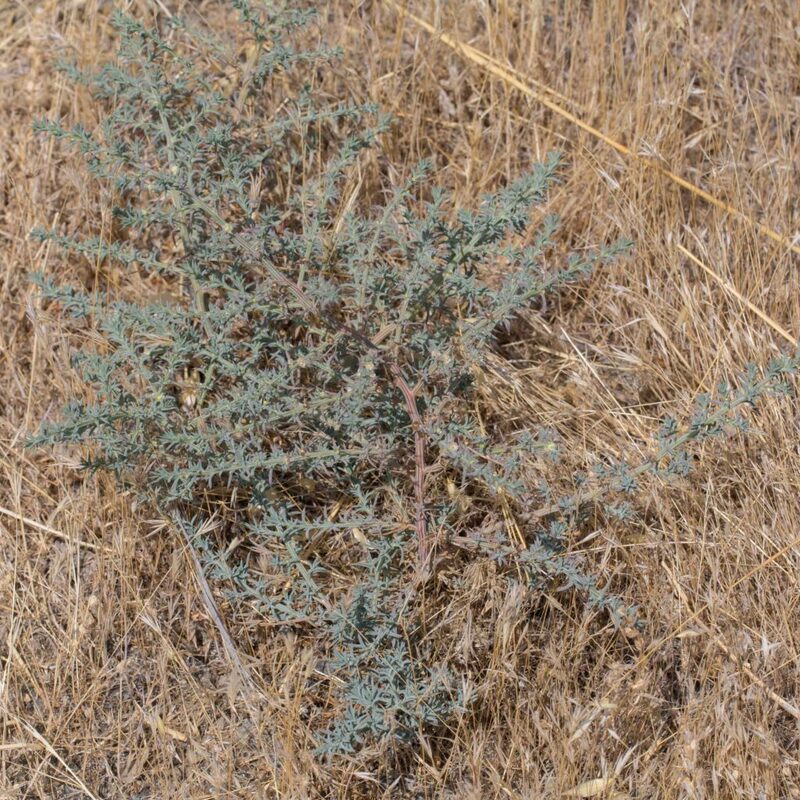 A largish shrub, generally wider than tall, with smooth not striated stems and twigs that are sometimes spine-like with age. 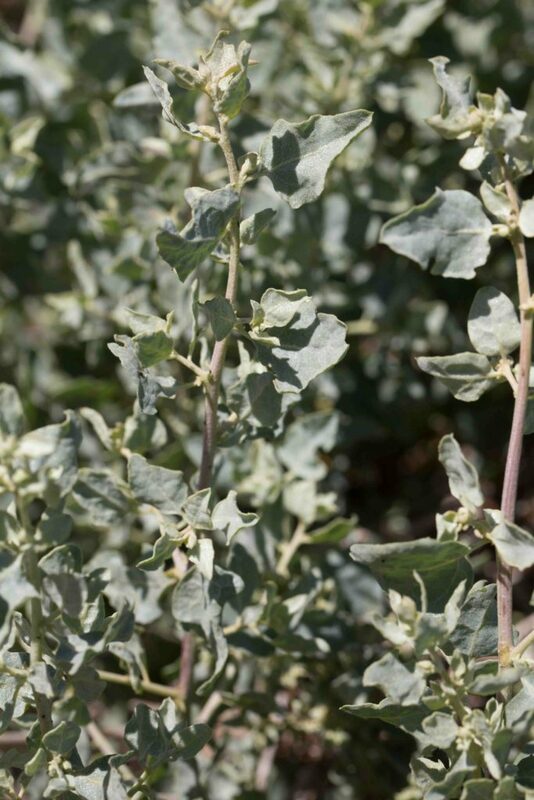 Leaves are ovate to deltate and scurfy (covered with small, bran-like scales), entire or wavy-edged. 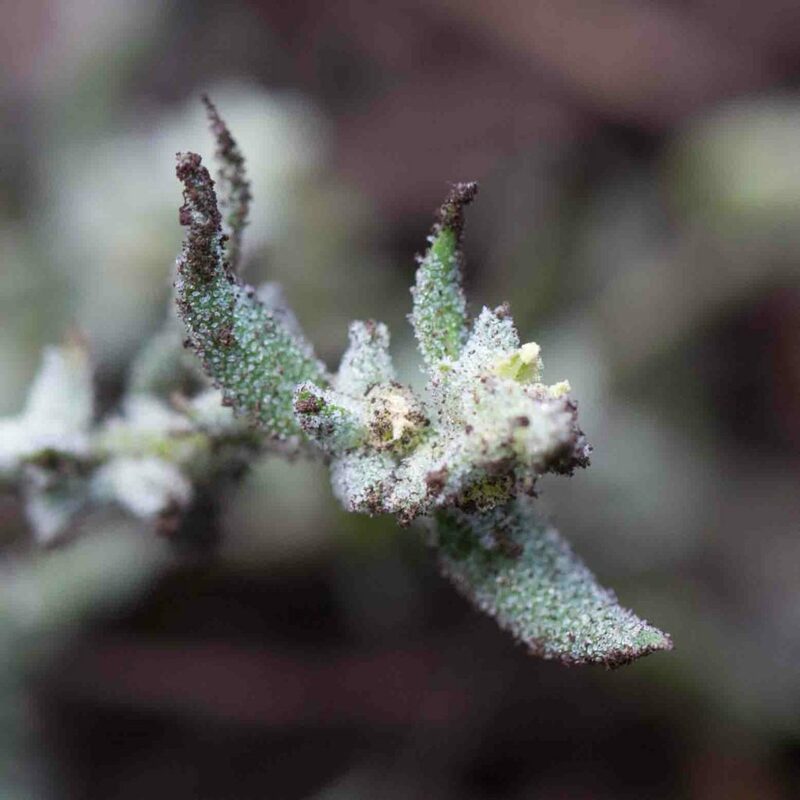 Fruit bracts are 2–6 mm long and fused to their middle. 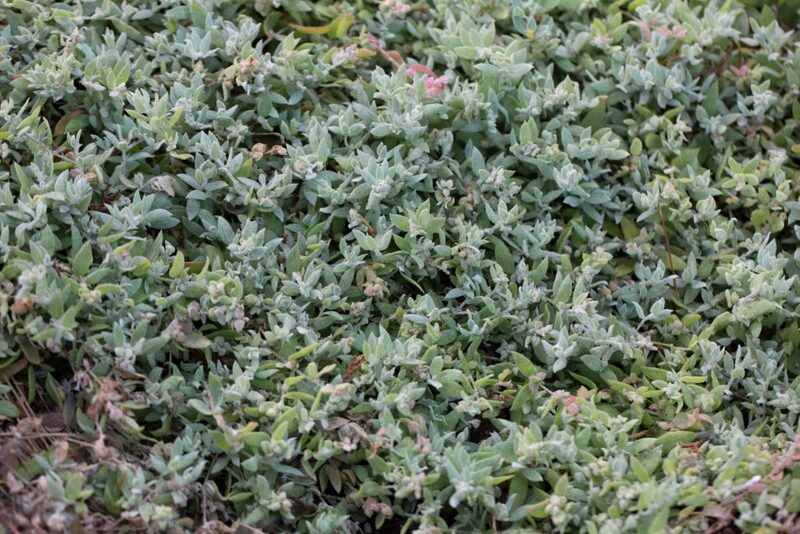 A prostrate and sprawling plant, generally growing near the high tide line. 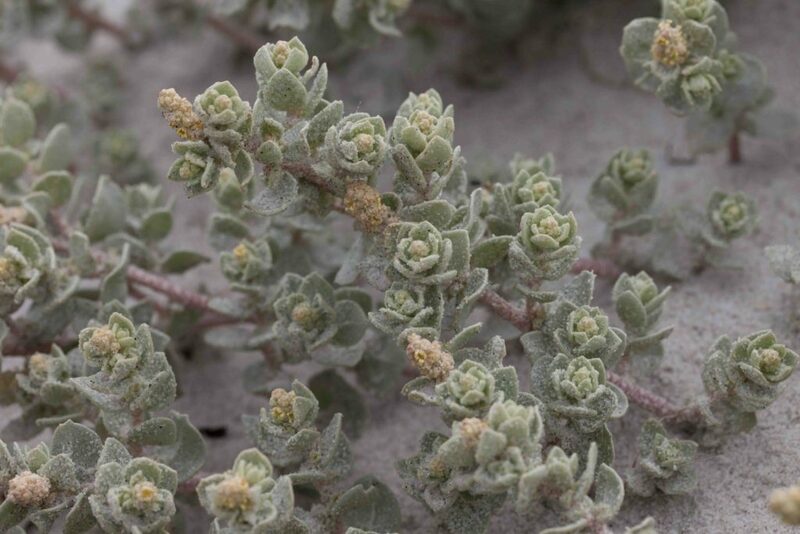 Leaves are pale olive-green and often covered in salt crystals. 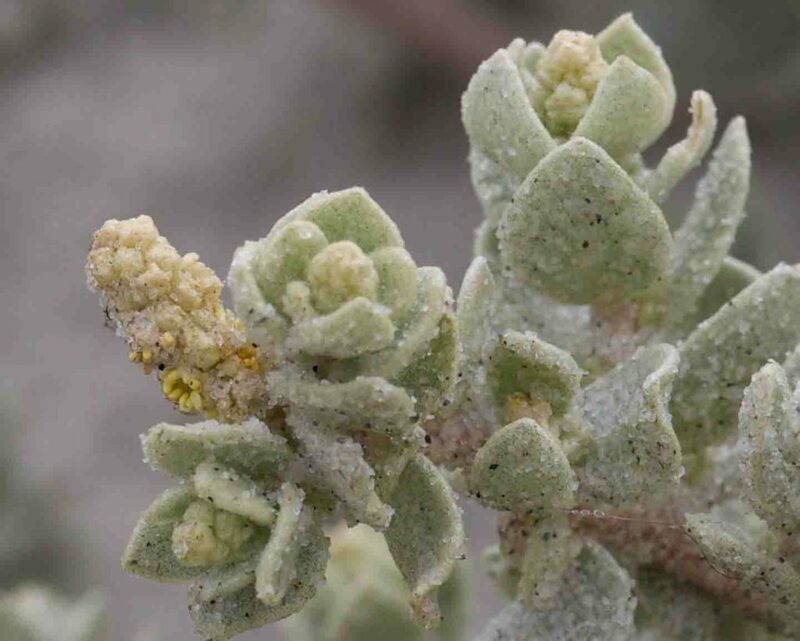 Monoecious, the male flowers occur in small, slightly elongated yellowish round clusters not surrounded by bracts. 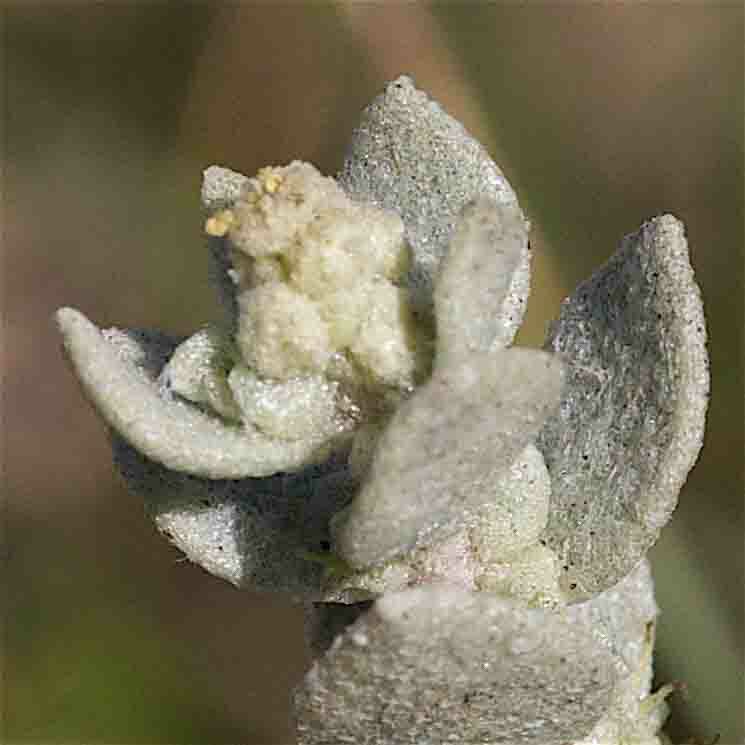 Female flowers are more or less spheric and surrounded by small, spongy bracts. 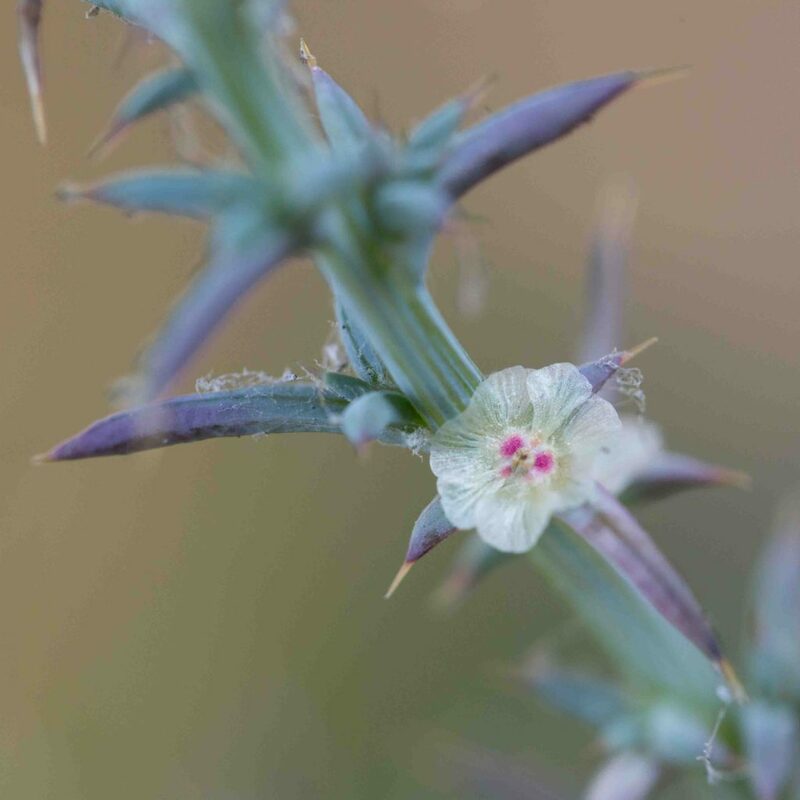 The right hand photo shows the female flower, the photo to its left shows both male and female. 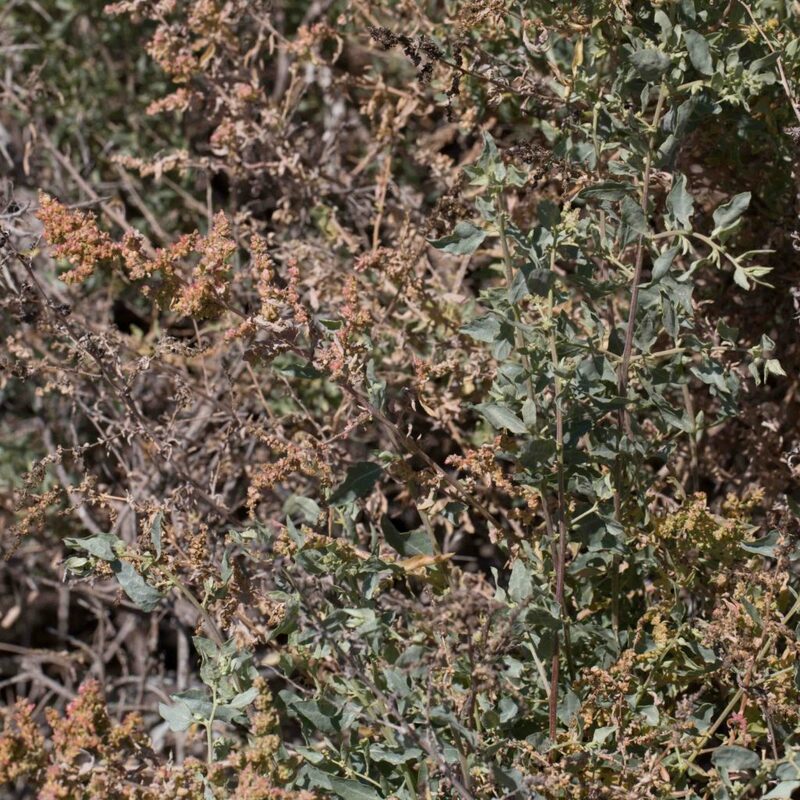 Common, but variable in appearance and, despite its scientific name is erect as often as it is prostrate. 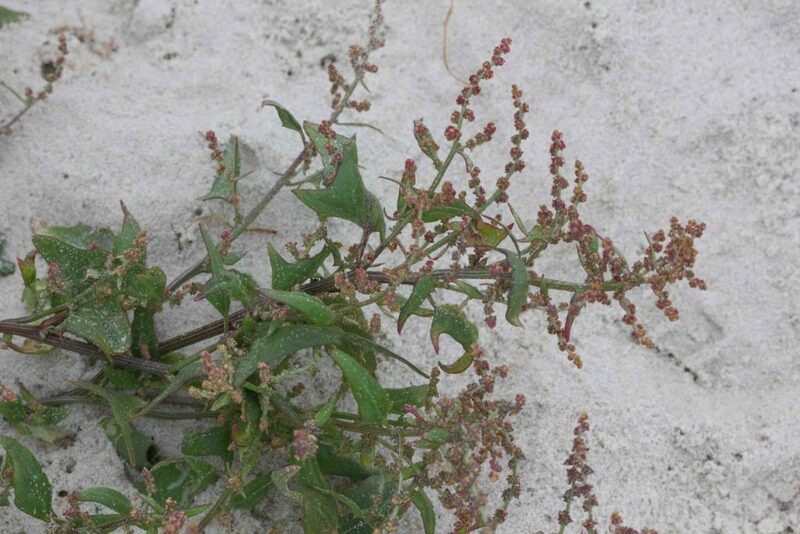 Its leaves are distinctive. 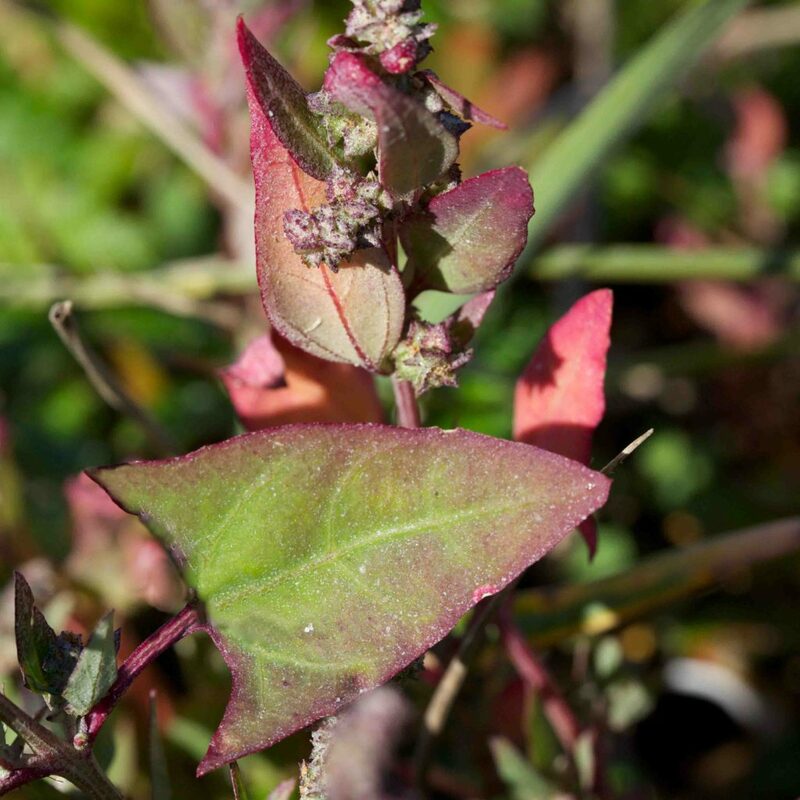 1–9 cm long, triangular-hastate, pure green when young but developing a strong reddish tinge with age. 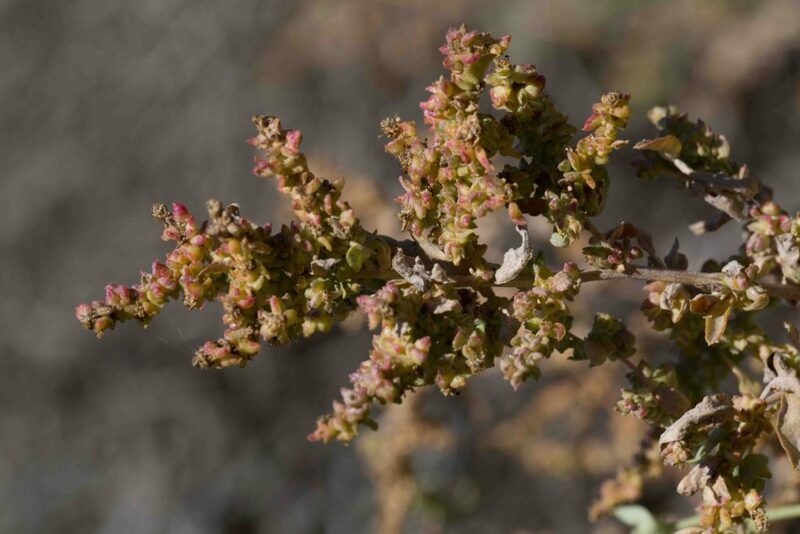 Flowers and fruits are borne in small terminal and axillary clusters. 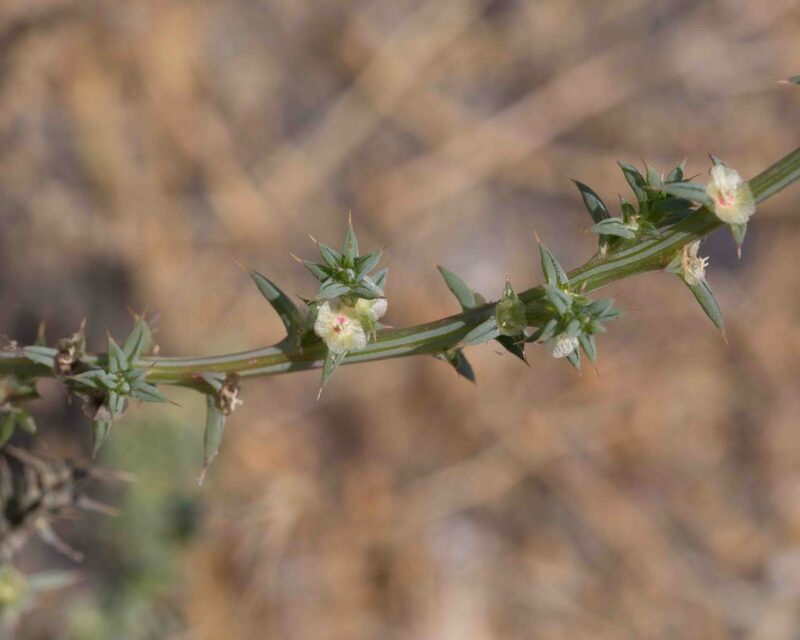 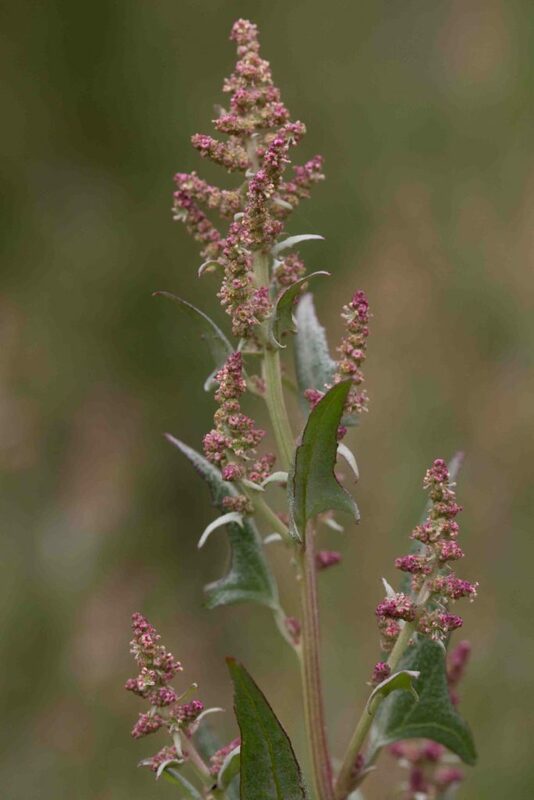 Extriplex is a close relative of Atriplex, distinguished by the number of calyx lobes (3–5 rather than 4) and by having 2 kinds of seeds rather than just one. 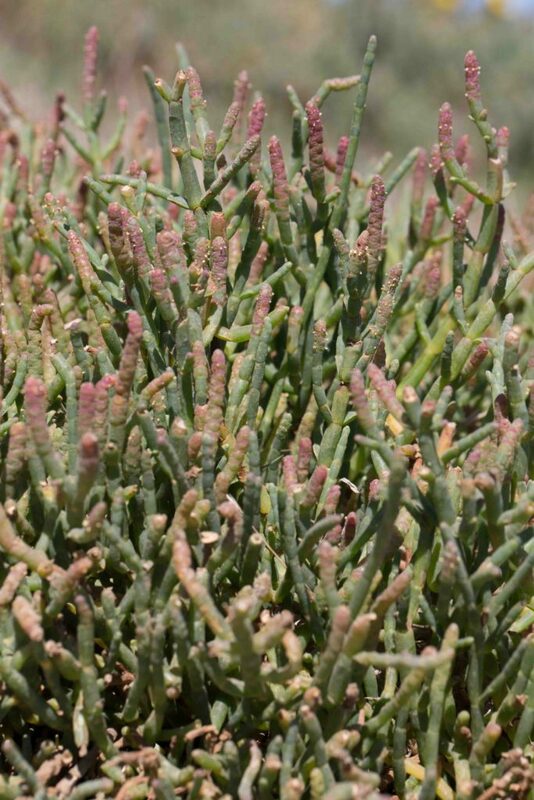 This plant is spreading to decumbent, sometimes prostrate, with gray-green to creamy, lanceolate to elliptic leaves which are scaly and crowded on the stems. 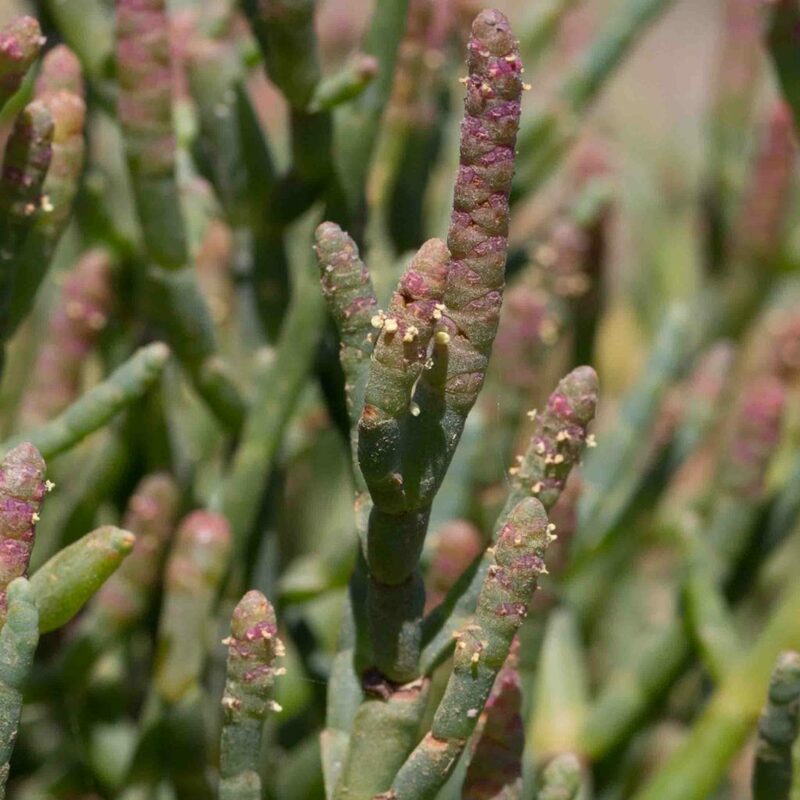 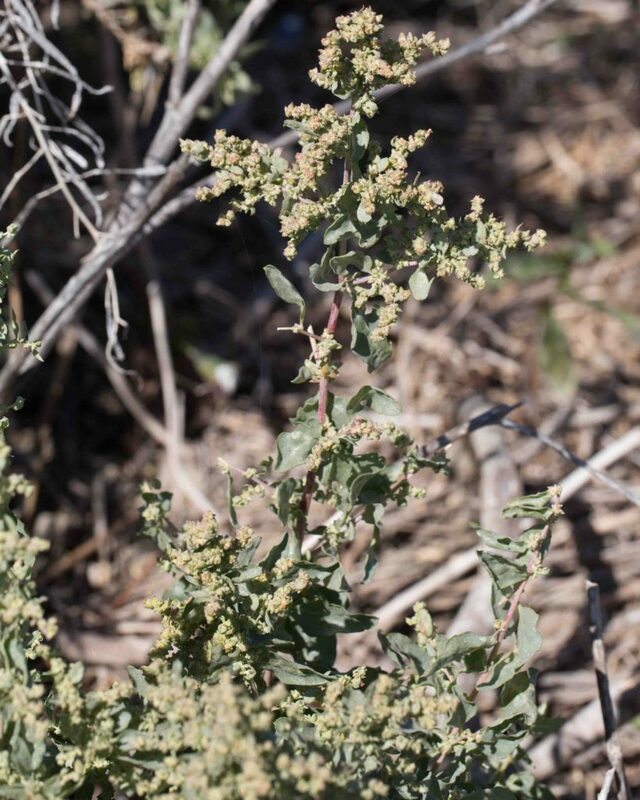 Like Beach Saltbush (Atriplex leucophylla), it is monoecious; the male flowers with a color similar to the leaves and crowded in long clusters near the tips of the branches. 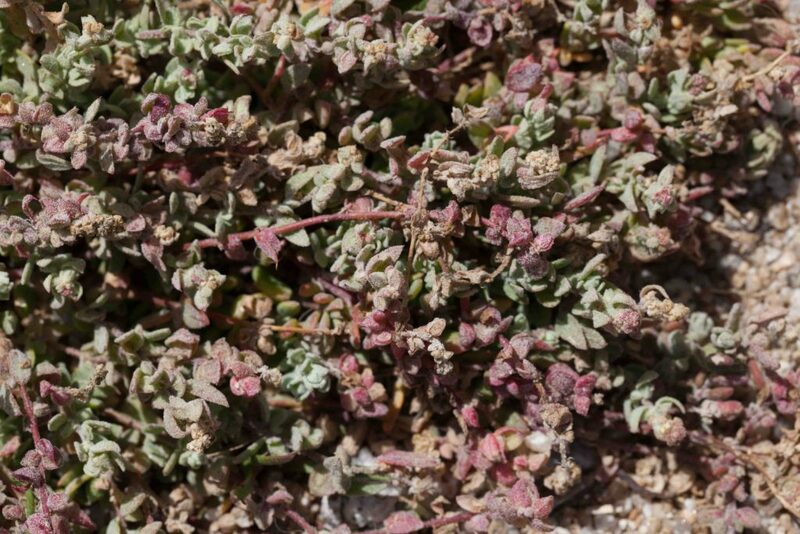 One of a small number of halophytic plants, i.e. 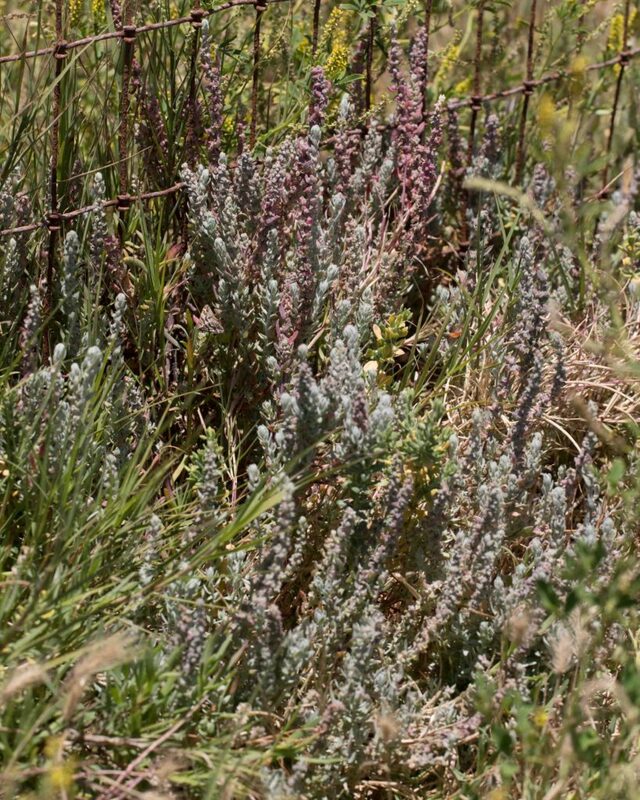 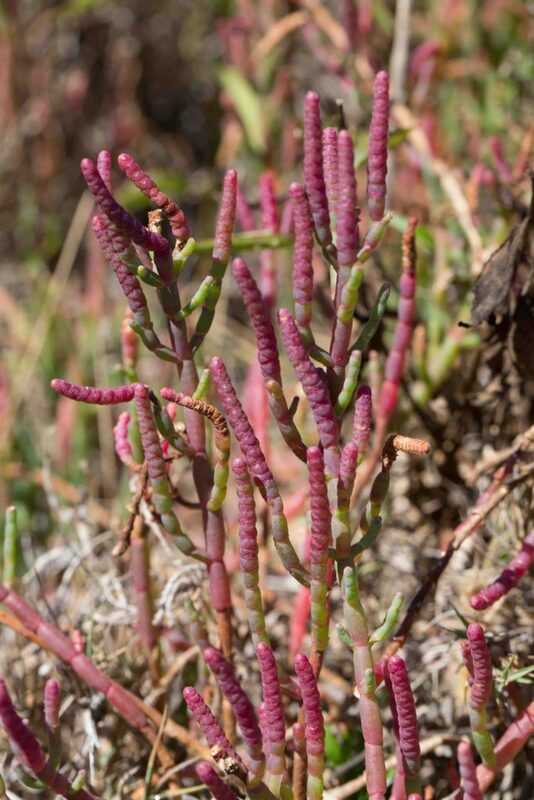 plants that can tolerate high levels of salinity, this is found in profusion in salt marshes. 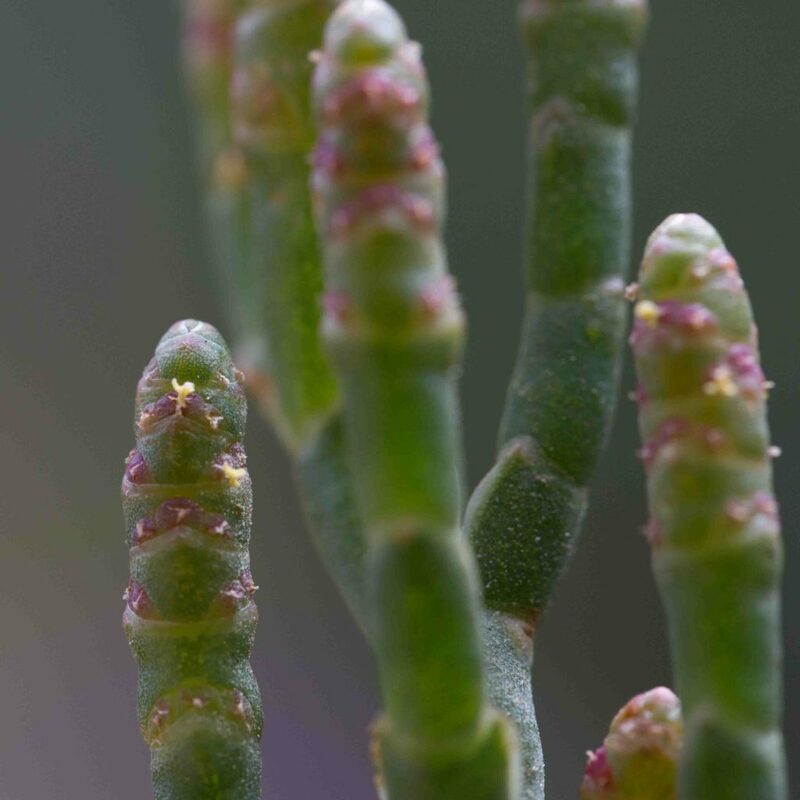 A decumbent, perennial subshrub, it has erect, fleshy, jointed branches, the joints 5–20 mm long, and tiny yellow flowers (little more than small extruding bumps in the photos) comprising 3 fleshy tepals, 1–2 stamens and 2 stigmas. 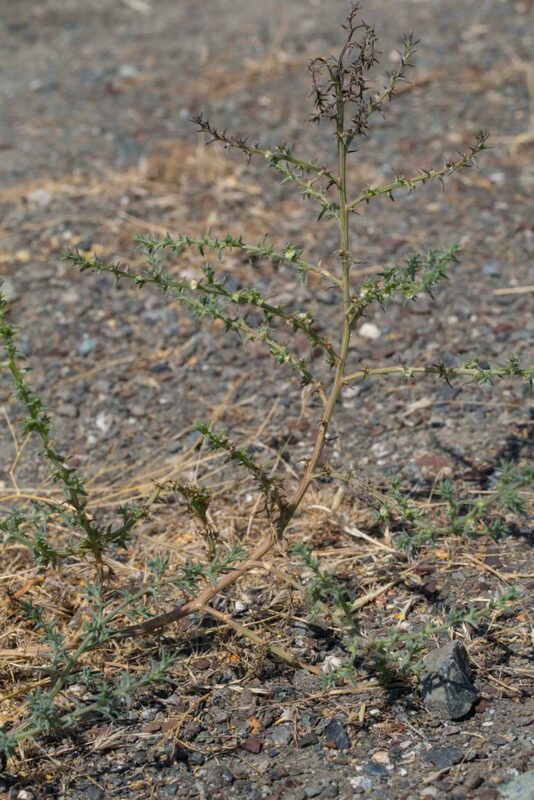 Stems are green to red, intricately branched, erect and curving, in maturity forming a round brambly clump that can break off at the base to form the “tumbleweed”. 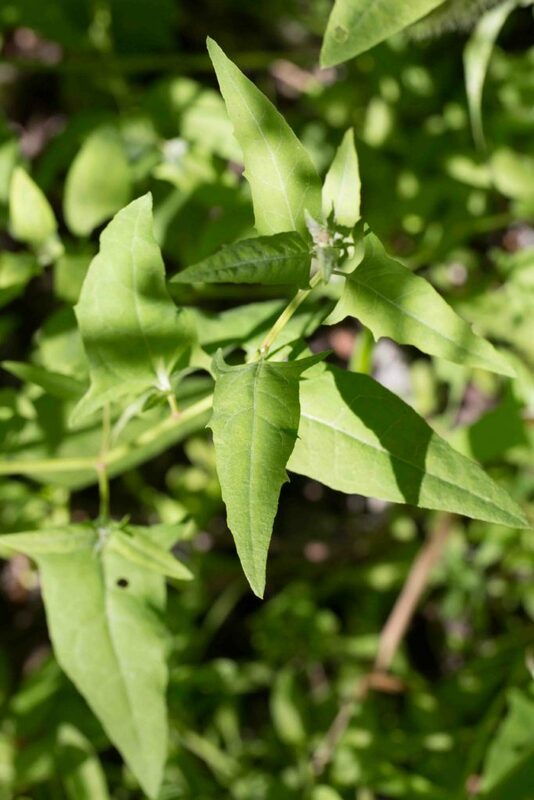 Leaves are very narrow with a broader base, stiff and spine-tipped. 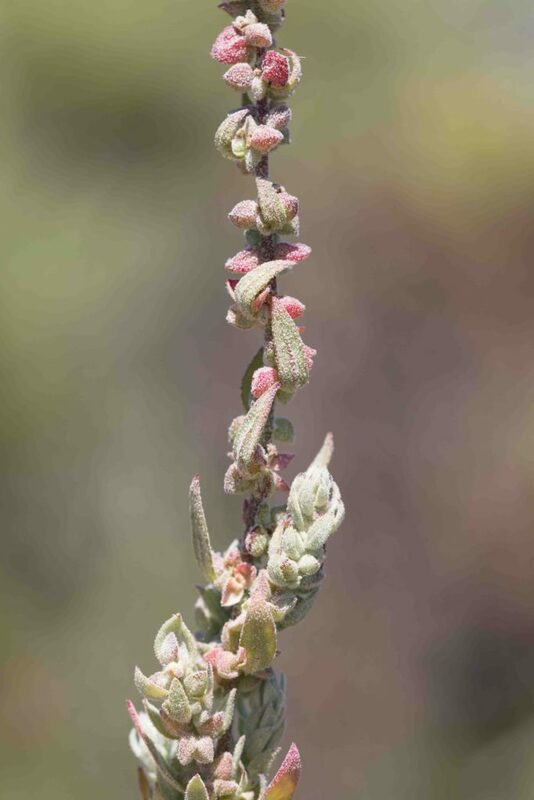 The flowers have no petals, sepals are surrounded by disk-like bracts, wide-winged and whitish to bright pink.